It's Tuesday already. Yesterday we had a visit from two of my husband's girl cousins. Haven't seen them in a long time, so was so nice to have time to visit and catch up. Life goes by each day so quickly, we sometimes forget how nice it is to slow down and just relax with old friends and long lost relatives. We made a pack to get together four times a year...........let's see if we can do it! 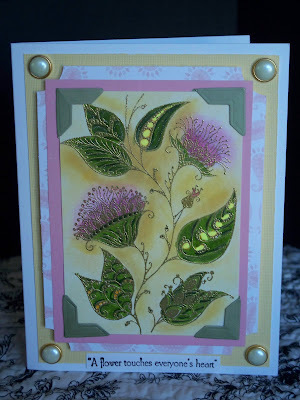 Today's card is such a pretty flower. I bought it this past weekend at the show and it is by Impression Obsession. The booth had a board done up with cards from IO and this stamp was on the board and I just loved it. It came out really nice, I am going to do it on black with chalks soon. Your card is beautiful! And you'll be seeing me this weekend!!! !